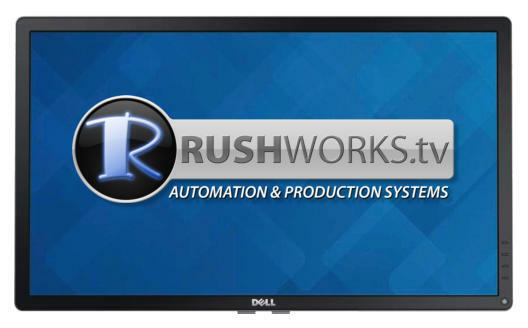 A-LIST provides all the features you need for 24/7 automation, supporting SD and HD on up to FOUR independent channels. Drag and drop scheduling includes a bug, two independent crawls, a dedicated EAS crawl, a text layer, and animated snipes with audio. Traffic import and as-run output are fully supported. Our 4U Precision Workstation supports up to four (4) SD & HD Input/Output channels. The standard configuration includes 2 x 2TB mirrored drives (RAID1). 3 x 2TB or 3 x 4TB drives (RAID 5) are optional configurations. Systems include a 22" monitor, keyboard, mouse and rack mount sliding shelf. Our 5U Precision Workstation also supports up to four (4) Input/Output channels but with dual processors, additional slots, and RAID 5 with 4 x 4TB drives. All systems include a 22" monitor, keyboard, mouse and rack mount sliding shelf. 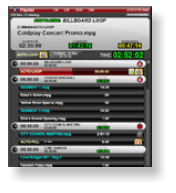 PLAYLIST AUTOMATION uses a simple, graphics- oriented drag-and-drop interface that makes list creation and management intuitive and fun. The unique system design offers unmatched flexibility and simplicity by playing any combination of files and folders … with automatic looping of specified folder content when tight scheduling is not required. Our unique PLAYLIST TOOLS let you create and manage all aspects of your playlist - from Events to Breaks, to multiple types and layers of Overlays. Display ALL layers over playback or live video without the need for additional hardware. DTMF and GPIO triggers supported. A-LIST integrates control of MATRIX ROUTING SWITCHERS to select and display the proper sources for scheduled Events. In our system configurations you can control a routing switcher that outputs directly to your transmitter, DTV encoder(s), or Internet streaming device … or to all of these simultaneously. 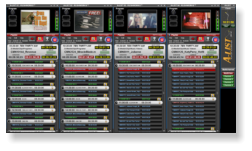 A-LIST automation software selects router sources such as playback cards, satellite receivers, and "LIVE" studios for display at the time of scheduled events - or when DTMF tones or GPI triggers are received. Multiple router control is supported. NETWORK ATTACHED STORAGE (NAS) is the best way to consolidate and manage all your digital media assets (files). It replaces the 'tape library' from analog days with a network-based file management topology that's simple to use and efficient, maximizing productivity at every level. These servers are designed for the highest level of redundancy and asset protection, and are available in capacities ranging from 4TB to 96TB. Our A-LIST systems can either play files directly over the network from your NAS, or prefetch (transfer) required playlist files from the NAS to the local drives. You can configure up to four (4) channels in a chassis, each with independent input and output. You can mix MPEG-2, H.264, MXF, AVI and MOV clips in a playlist with seamless back- to-back playout. All clips automatically up and down convert based on your output resolution setting, which can 480i, 720p or 1080i. You can create schedules directly in A-LIST using two different methods: WEEKLY and/or DAILY. Weekly lists are simply named Monday.rwpls, Tuesday.rwpls, etc. These automatically load at midnight (or user-specified time). Daily lists can be created as far into the future as you wish. The naming format is YYYY-MM- DD.rwpls. These can coexist in the Playlists folder, and take precedence over Daily lists. If you’re using a third-party traffic and billing system, we provide an optional Traffic Import Utility that parses the daily output logs (plain text) and creates RUSHWORKS playlist files (.rwpls). We interface with most T&B systems, and create additional system parsers when requested. 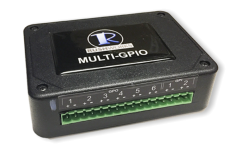 If you need multiple GPI and/or GPO ‘trigger’ capability in your A-LIST Broadcast Automation Master Control workflow, our USB MULTI-GPIO box is the ticket. The GPI input connectors can accept either TTL or DRY contact closures. Use the respective switches for GPI 1 and GPI 2 to match the signal input type.